How bad is it? 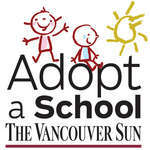 We received a call from teachers at Maple Ridge Secondary, which already receives help to provide breakfast. But kids need lunch, too, and the teachers had been fundraising among themselves for that. And they had run out of money. Could we help? We can, but only because of our readers and supporters. Your $25 will provide a needy student with lunch at school for two weeks. For $100, feed that student for more than a month. For $500, you can ensure a student gets lunch for the entire school year. And you could be making a big difference to some kid's future, not to mention the present.